While doing my Costco shopping this past weekend, I noticed they had gotten in their fresh cranberries...so I bought a big 2-pound bag of them. I decided to go ahead and break them in by making a recipe with them. 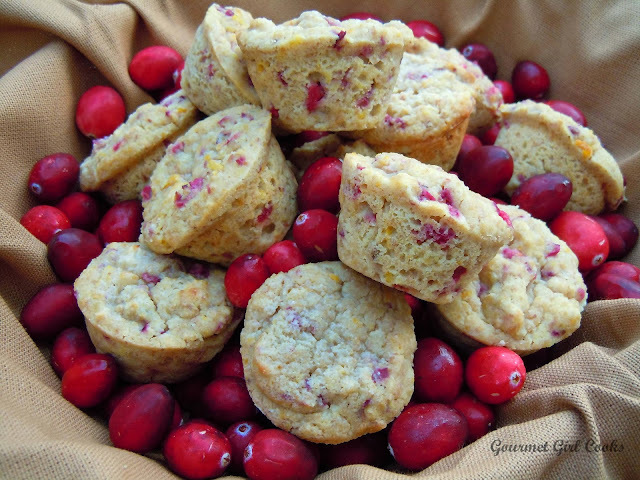 Cranberries are one of my holiday favorites and one of my favorite things I used to like to make with them was cranberry orange bread with nuts -- it was "bread" only because it was baked in a loaf pan and looked like bread...because the truth is it was sweet enough that it really counted more as a "cake" instead. I wanted to make something less sweet and more suitable to have for breakfast or a nice little snack to have with a cup of coffee. I wasn't looking for dessert. 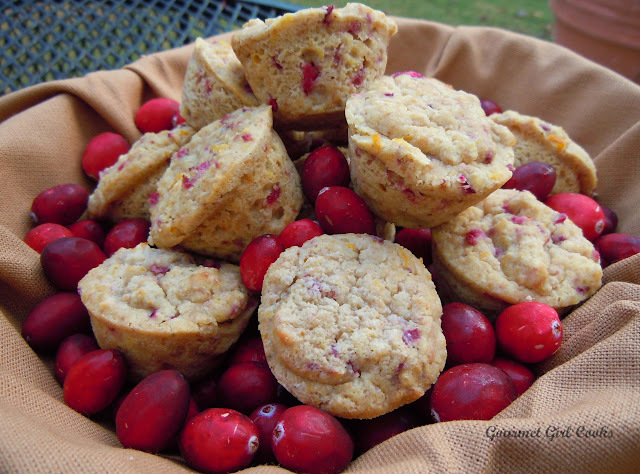 I decided to make mini muffins that had the same cranberry, orange and walnut flavor I loved, but with more of a bran-muffin type texture. I knew if I used all almond flour that they would be more cake-like...so instead, I used a combination of golden flax, almond flour and a touch of coconut flour to soak up any extra liquid that might come from using fresh cranberries. They turned out great -- not overly sweet, but just sweet enough (for me). If you like them sweeter, by all means increase the sweetener...just taste your batter for sweetness before baking them and adjust it accordingly. I snapped a few photos below as well as the recipe. Enjoy! Preheat oven to 350 degrees F. Lightly spray mini muffin pans with oil and set aside. In a large bowl, whisk together almond flour, ground flax, coconut flour, baking powder and 1 cup sweetener until combined. In a separate medium bowl, beat eggs, oil, vanilla and orange extract, buttermilk and orange zest until well combined. Add wet mixture to dry mixture and stir until combined. Fold in cranberries and walnuts. Spoon batter into muffin cups, filling almost to the top. If desired, sprinkle top of each muffin with granular sweetener. Bake for 18-21 minutes, or until a toothpick inserted in the center comes out clean. Cool about 5 minutes in pan; flip and cool completely on a wire rack. Makes approximately 3 dozen mini-muffins. These are sure to become a favorite at our house! Can honey be substituted for the sweetener? If so...do you think it would also be 1 cup? Thank you for inspiring healthy recipes. I wonder if buttermilk can be substituted with coconut milk + vinegar or else in the recipe. Thanks. Wonderful blog! Great recipes lately as always. Thank you! I got a big bag of dried cherries at Costco last week. Haven't made anything with them yet like i was supposed to! Just keep snacking on them! This sound wonderful!! Please, please develop a recipe for bran muffins made with almond bran. Almond bran can be purchased from Honeyville. I found a recipe on another site but haven't had any success with it. All your recipes work perfectly for me. 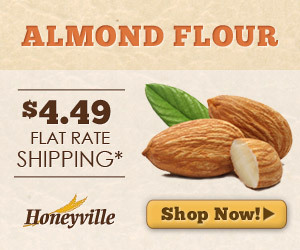 I didn't see almond bran as one of Honeyville's products on their site, but nuts.com does have it. I will be ordering some-really miss bran muffins! 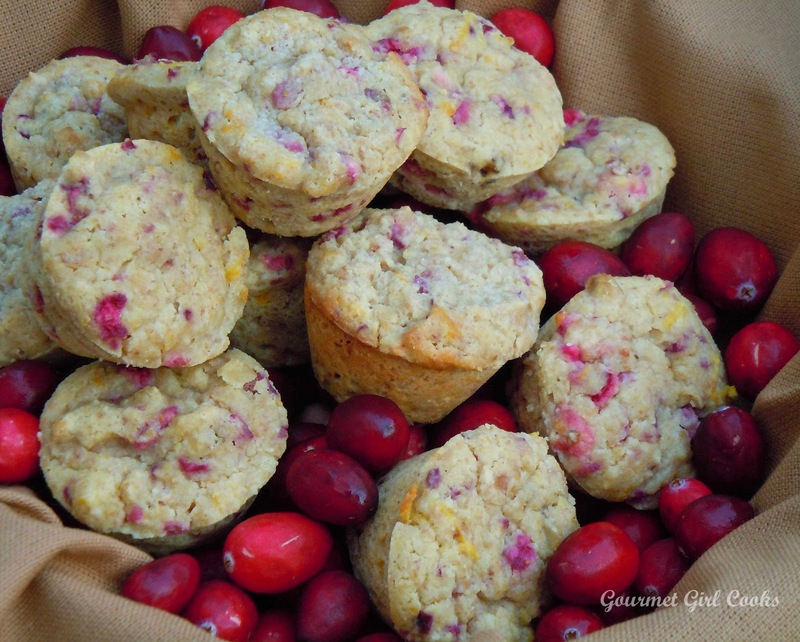 This muffin recipe is on my list of Saturday baking this week! Happy Halloween! I am wrong. I did purchase the almond bran from Nuts.com. Sorry for the confusion. I look forward to making this recipe this Sunday, and I was wondering about a few things. What do you think the flax adds to the party? You know, rather than say 2 cups of almond flour? Also, why did you go with olive oil or coconut oil, rather than butter? I'm not being critical AT ALL, I LOVE your recipes, but I was wondering at your thought process for some of your choices. I want to "pick your brain" so to speak. (Maybe I have been reading too many Cook's Illustrated issues)...Thanks for all your help! I made these yesterday and used 1 1/2C almond flour & 1/2C chia seeds (I keep reading about how healthy they are!) The muffins came out wonderful, and I love the bit of "crispiness" the chia seeds give them. I think the minis would be great for Thanksgiving dinner, as they're not very filling! Also looking forward to making the cranberry sauce recipe-I've paired turkey w/cranberries since childhood, and was shocked to see how much sugar is in the store-bought sauces! These are freshly out of the oven, couldn't wait for them to cool! Very very good! Will add to my baking rotation. Didn't have 3 mini muffin tins so added the leftover batter to my donut pan, made 4 wonderfully delicious donuts! The muffins just came out of the oven. 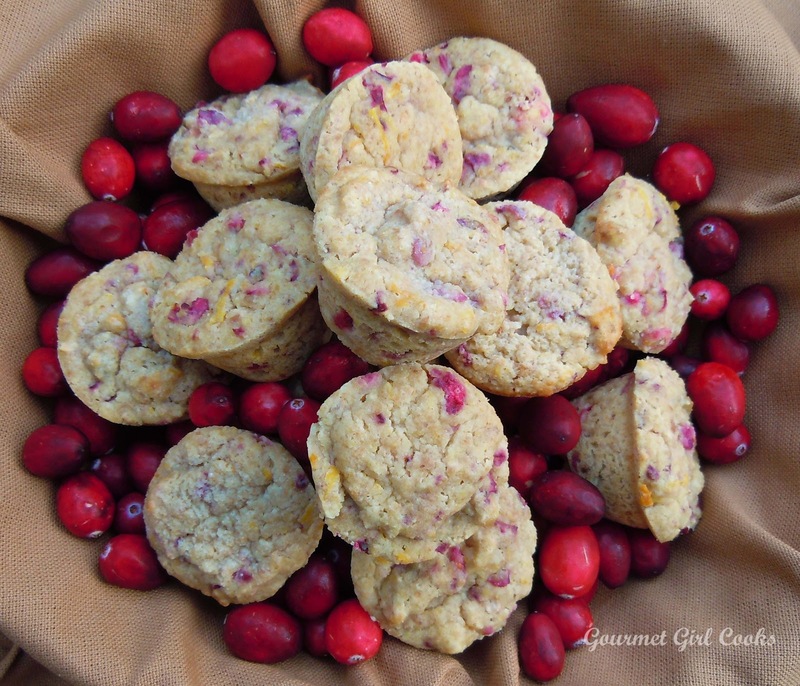 They are absolutely the best wheat-free, sugar-free muffins I have baked over this past year's journey. I baked them in a muffin-top pan to get that crunchy bottom crust. These muffins will be in my freezer all the time. Breakfast for Dinner -- Happy Halloween! New Feature on Gourmet Girl Cooks! Roast Beef Taco Cups -- "Fresh-Mex"